“Guardian has handed a gift to terrorists” is one of the things being printed in newspapers across the Great Britain recently. The “gift”, for those of you not aware, are the files Edward Snowden leaked revealing how the American NSA, and our own British CGHQ, have been monitoring everything that you ever do on the Internet. But they won’t strike in this country. They won’t strike in America. They will strike in their own home-countries. And they will probably strike British or American troops because over there, that is who the terrorists are. They have ganged up and invaded a country they had no right to invade and now they brand any kind of retaliation an attack by rebel extremists. Honestly, when was the last time you know of terrorists to actually attack this country? We could say 7/7, or 9/11 even but there is no real hard evidence to show that these were carried out by a gang of Muslim Extremists, though there is a lot of evidence to say that these were both false-flag attacks carried out by the very people looking out for us. There have been a few Muslim-related attacks in this country but these have white, British people bombing mosques or attacking Muslims in the street due to the fear installed in them through the mainstream media. That’s pretty much the closest we’ve been. Or there was that one attack on Drummer Lee Rigby in South East London earlier in the year. That was awful, but what a lot of people have done is choose to ignore the interview ITN did with the person who was part of that brutal murder. He started off by apologizing and expressing how bad he felt for the fact that what just happened and happened and for the fact that women and children had to witness it, but he then went on to explain that in countries in the Middle East that we are “liberating” this goes on all of the time. Women and children are being murdered in the streets by western armies and people sitting in their homes here might think it’s bad, but they won’t realize just how bad it actually is until they are face-to-face with the actual realities of it. So that’s one actual “terrorist” attack I can think of that’s happened on the streets of Britain and that has only happened because the British and US governments have pushed these Muslim countries into a corner. It kind of makes you think twice about who the actual terrorists really are, doesn’t it? So what then, exactly, are these security agencies doing with all this information they are gathering on everyone? Not just a list of people to keep an eye on, but everyone. 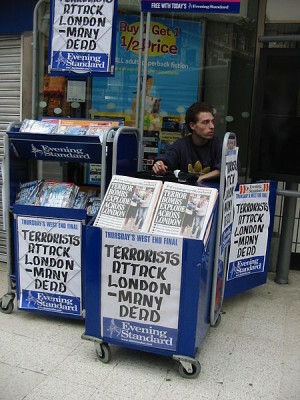 Are we all suspected terrorists? Are we all now guilty until proven innocent? Maybe it’s just a power-trip. Maybe it genuinely is for our own safety. Or maybe it’s just another cog in the machine of total control being brought on by the very same elite that want a one-world government. Edward Snowden has done nothing wrong. All he has done is exposed some more corruption in a world that most of us already knew was completely corrupt. To have him arrested and put on trial for these “crimes” he has committed would be a crime against humanity. I read an interview with the US secretary of defense not long after the initial leaks and he literally said one of the reasons they were so annoyed with Snowden was because “He has been reading our secrets and revealing them to people who weren’t supposed to know them”, which is far, far different from reading every conversations everyone has with anybody. Oh, wait. It’s exactly the same. What is now happening is the same in school when a kid is being bullied. He’ll tell a teacher about the bully and that will piss the bully off more. Only this time the bully isn’t a single child, it’s the most corrupt, unstable, and secretive nation in the known universe.